The Office 365 Groups workspace connected to modern SharePoint team sites provides a shared calendar. 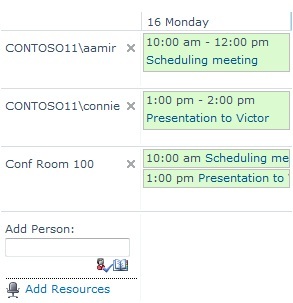 You and every member of your group can schedule a meeting on a group calendar in Outlook. A group calendar enables you to see multiple calendars at the same time. For example, a group calendar is helpful when you schedule a team meeting, because you can see the availability of team members and conference rooms. Note: To change calendar settings, you must have at least the design permission level for the site. Under General Settings, click List name, description and navigation or Title, description and navigation (depending on the version). In the Group Calendar Options section, set Use this calendar to share member’s schedules to Yes. This enables you to create events in the calendar with attendees. If you want to use this calendar to scheduled resources, such as conference rooms, as well as people, set Use this calendar for resource reservation to Yes. This enables you to create events in the calendar that include resources, such as conference rooms. Note: If the Use this calendar for resource reservation option is not available, the Group Work Lists feature is not enabled for the site. Note that the Group Work Lists feature is not available in SharePoint 2013 and later versions. Note: The view created using the following procedure is temporary. Each time you refresh the browser, only the initial calendar will display. Go to the group calendar and click the Calendar tab in the ribbon. In the ribbon, in the Scope group, click Day Group or Week Group. In Add Person, type the name of the person or group whose calendar you want to view and then click the check names icon. You can also click the browse icon, and search for the person or group. Following is an example of a group calendar created using the previous procedure.